Roofing a House: Are You Paying Too Much for Roof Installation? Are you in the process of roofing a house? If so, you know how expensive this process can be! But did you know how often roofing installation companies rip off people who are unaware of how much roofing should cost? Curious how much roofing installation should cost or if you’re paying too much? In this article, we’re covering everything you need to know about roof installation, so you can pay the right price for the best service possible. How Much Should Roofing Cost? When it comes to roofing, the average homeowner spends a little over $7000 to install a new roof. It’s important to know, however, that this price varies with each passing year, and can fluctuate based on a variety of factors. Quality roofs are designed to last for 20-25 years, so if your roof is reaching that age it may be time to replace it. At the very least, you should have it inspected by a roofing expert who can assess the maintenance and materials of the roof. If your roof is experiencing leaks, it may be best to replace the entire roof. While you can do a patch job, these jobs usually only last for so long. The last thing you want is for your roof to collapse and cause extensive damage to your home. If you’re thinking of selling your home and want to increase the resale value, you may want to replace your roof. This can improve your home’s overall appeal and provides you with an opportunity to add cool technology updates that will make your home stand out. How Much Does Professional Roofing Installation Service Cost? The main thing to know about professional roofing installation service is that the cost can vary wildly across installation companies. In general, however, most roofing contractors will price their roofing services to be about $350 to $500 per square foot of architectural shingles installed. The installation cost itself tends to be around 60% of the total cost of your roof replacement. When it comes to your roofing project, you should be more concerned with the quality of service than the overall price tag. 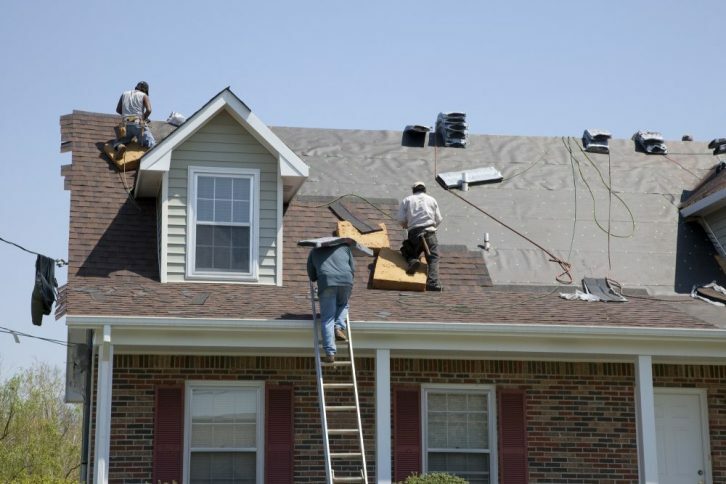 If you just go with the cheapest contractor, you’re more likely going to end up with an inferior roof, as they’re more likely to cut corners, use cheaper materials, and prioritize speed over quality of work. Instead, ask family and friends for suggestions on service providers. Pick three to four roofing companies and ask them about their previous jobs, their insurance policy, and inquire about any testimonials or references they have. You may ultimately end up with a more expensive provider, but they’ll be most suited to complete your roofing project in the most effective and long-lasting manner possible. If you’re roofing a house, you know how delicate (and expensive) the process can be. By reviewing the content in this article, you’ll know what you should be paying for your service, and how to avoid an inferior service that will ultimately just rip you off. Ready to begin your roofing project but not sure where to start? Want the best bang for your buck? Request an estimate to get started!